My walk home this morning. Newspapers flying through the air to land in sometimes wet front driveways. Vegetable vendors offloading from autorickshaws. Sunlight slanting in motes of dust, through the branches of trees. The still-lingering nip in the air that makes me–almost– forget that I am still limping, 9 weeks after the knee surgery. Steaming, tiny cups of chai and kaapi at various corners. Rangolis that are much smaller than they were last month. A little boy reluctant to get off his mother’s two-wheeler, at his school. Beans more tender than a child’s finger, and a cauliflower with a caterpillar smiling up at me…that makes me decide to buy them (no pesticides!) Smiling at several people whom I don’t know but see regularly. I arrive home, feeling peaceful and happy. Surely, this is a perfect life. 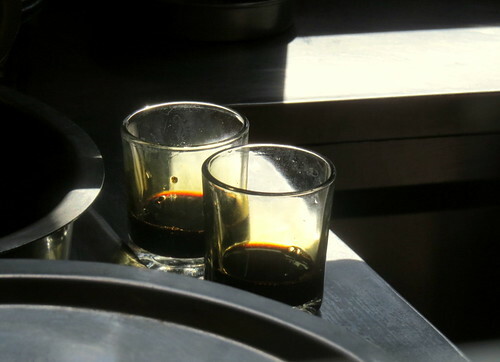 the south Indian “filter kaapi” (coffee that has been percolated through a filter, and always made with milk) is first poured into the glasses, where the colour gleams invitingly in the sunlight. 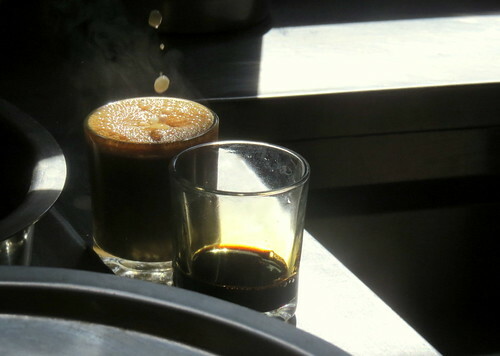 Then, boiling, frothing milk (with or without sugar , as per the customer’s requirement) is added. One is one, the other one waits…. May be someone’s last moment on earth. So tough to understand this, but it is true. I wonder why there is no logic in life or death. Not be spared to the world? Be cut down in a lightning swathe of random fate? I do not understand life…or death. You are currently browsing the Deponti to the world blog archives for January, 2018.